Players may now further upgrade their angels by using the Angel Evolution System. Evolve your Angels to increase their stats and unlock elemental damage! - Each angel can evolve 10 times max. Each successful evolution will increase her stats, Elemental Damage, and Elemental Shield level. - Stat increase is percentage based. The higher base stats your angel has, the more stat benefits you get! The base stats can be increased by leveling the Angel with Angel Tears and Holy Crystals. - Elemental damage and Elemental Shied will be unlocked after first evolution; your angel can deal extra elemental damage during battle now! - Angel Evolution also affects Guardian Angels. Your Heroes will become stronger because of the evolved Angels. 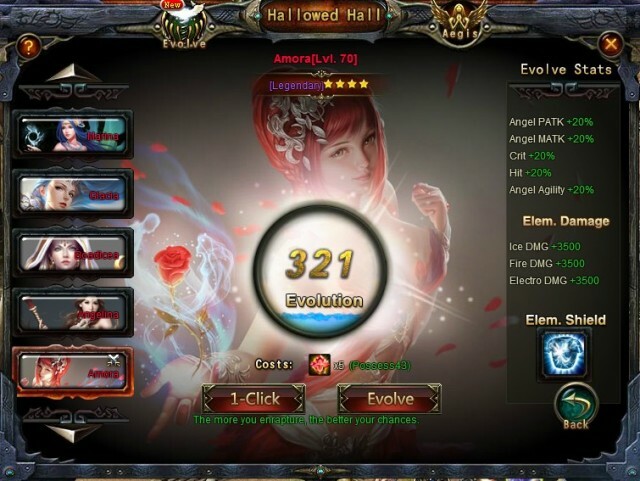 Open the Angel menu and click on Evolve to open the Angel Evolution menu. To evolve an angel, you will need Seraph's Stones. They can be found in the Shop and in the Arena Shop. - Click on “Evolve” to obtain Evolution points. You may also click on “1 – Click” if you have enough Seraph's Stones. Compare the Stats before and after the Evolution on the right hand side. - Every time you spend Seraph's Stones, there is a chance for your Angel to evolve. The probability increases as you gain more Evolution points. - After evolving once, your angel will gain an extra Star beneath her name. - If the source angel's Evolution level is higher than the target angel's, the target angel will inherit it. - If the target angel's Evolution level is higher than the source angel's, the target angel's Evolution level will not change. However, the source angel's Evolution level will still be reset. - Evolution points do not transfer. The source angel's Evolution points reset after inheriting; be sure to finish the upgrade before inheriting.